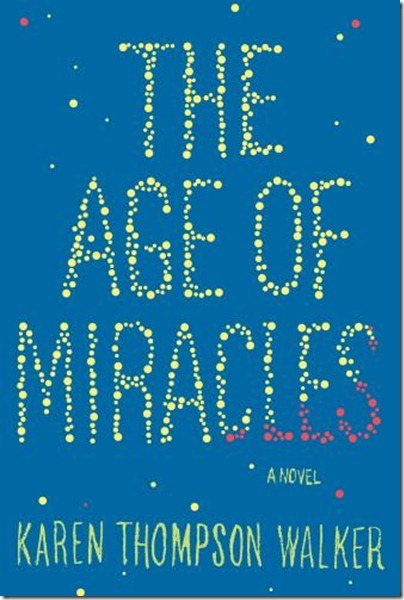 Like much of the best apocalyptic fiction Karen Thompson Walker’s The Age of Miracles begins with a frighteningly simple premise: one morning, for reasons that are never fully explained, the world wakes up to discover that the Earth’s rotation has begun to slow. At first the effects of the phenomenon seem minor: a few minutes more of night, a few more of day, but these outward changes disguise deeper disturbances. Gravity begins to change, affecting people’s balance, confused by the changes in the Earth’s magnetic fields birds begin to lose their way, colliding with windows and walls, the tides begin to grow higher, changes that grow steadily more pronounced as the slowing increases, and days stretch out towards 30 hours and then 36, 48, until days last 24 hours or longer, and nights the same. It’s a scenario that might fuel a Hollywood disaster movie, a fact that might explain the novel’s extraordinary seven figure advance, but Walker holds back from the fireworks, instead electing to tell her story from the vantage point of eleven year-old California teenager Julia, and to focus not upon the existential threat but the way in which the slowing disrupts “certain subtler trajectories: the track of friendships, for example, the paths toward and away from love”. In itself this is not a remarkable decision. Most apocalyptic fiction seeks to chart the lives of ordinary people caught up in extraordinary events. But the nature of the disaster in The Age of Miracles makes it seem particularly apposite, at least at first. For unlike the sudden, cataclysmic transitions of books such as The Day of the Triffids or Colson Whitehead’s zombie novel, Zone One, the apocalypse in Walker’s novel is a slow one, a steady unravelling which allows life to continue, albeit altered both by the changing world and growing uncertainty about what lies ahead. In this respect the book serves as an interesting addition to the growing list of novels such as Lauren Groff’s Arcadia that seek to give voice to the psychological effects of the creeping disaster of climate change. Yet unlike a novel such as Groff’s, it seems unable to harness the power of its material in any meaningful way, preferring to use the changing planet as a metaphor for the ways in which Julia’s family and those around them begin to spin out of control as the days lengthen. Almost 40 years ago the writer Brian Aldiss dismissed John Wyndham’s novels as “cosy catastrophes”, essentially conservative works that see the world swept away, only to be reconstituted along lines that suit the (usually white, male and middle class) protagonists. Aldiss’ assessment of Wyndham’s novels is highly debatable, yet The Age of Miracles takes this tendency one step further, managing not just to reveal the domestic implications of disaster but to domesticate the apocalypse. For in the end the world’s slow dying changes little: people adapt, going to work in the dark and to bed in their basements. Even those larger tensions that are glimpsed, such as the growing rift between those who elect to follow the government’s edicts and live according to the old 24-hour clock and the growing minority of “real-timers”, who embrace the new rhythm of the world’s turning are oddly unthreatening. Part of the problem is undoubtedly the novel’s adolescent fixation on domestic drama, a quality that means the novel too often sounds more like Young Adult fiction than a book grounded in the full complexity of adult experience. Similarly there is, at least to my mind, something a little too mannered about the prose, and in particular its constant invocation of the ecstasies of ordinary experience (as the novel’s title attests). But in the end the problem is simply that the novel has almost nothing to say, either about the questions of survival and extinction at its heart or the more trivial, human dramas it seeks to explore. In a way this failure of imagination is unsurprising. After all, as the critic Fredric Jameson has observed, most of us find it easier to imagine the end of the world than the end of capitalism and the contemporary social order. Still it’s difficult not to feel faintly depressed that in a genre that once produced books as brilliant and terrifying as J.G. Ballard’s The Drowned World and John Christopher’s The Death of Grass it is novels as bland and sentimental a The Age of Miracles that now excite us. Originally published in The Weekend Australian 18 August 2012.